It's been almost nine months, and blown 28-3 lead jokes from Super Bowl LI still never get old. 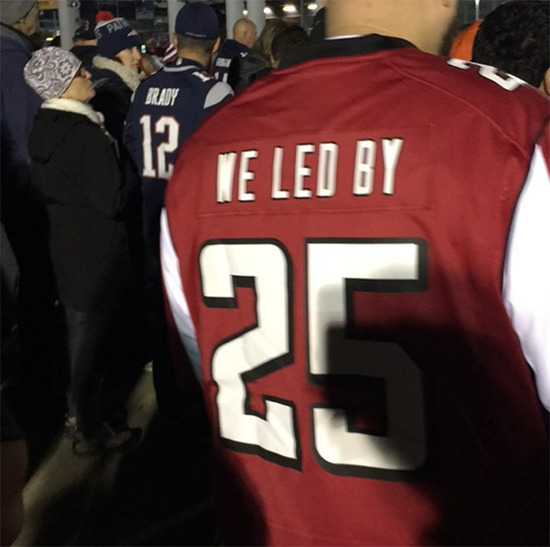 With the Patriots and Falcons meeting in Week 7 in a rematch of sorts, as well as a blown 17-point lead for the Falcons last week against Miami, the jokes have made a bit of a resurgence. That's the way to go about it. When your team rips the heart right out of your chest on the world's biggest stage, it always helps to have a good laugh about it. I'd probably do the same thing if I felt like parting with $150. Considering the rapid way that players are always switching teams in today's NFL, this seems like a decent investment, while wittily remembering a game you probably don't want to remember. Having a sense of humor is always helpful as a football fan. Earlier in the season, a Carolina fan made some noise when he was seen at Bank of America Stadium in a similar jersey. Coming from a fan of the team, though, this one is much funnier. God bless the NFL Shop, for allowing something like this to happen.